Auger Filler machine for flours like wheat, Maida, besan powder, skimmed Milk powder, insecticides auger powder filling machine. 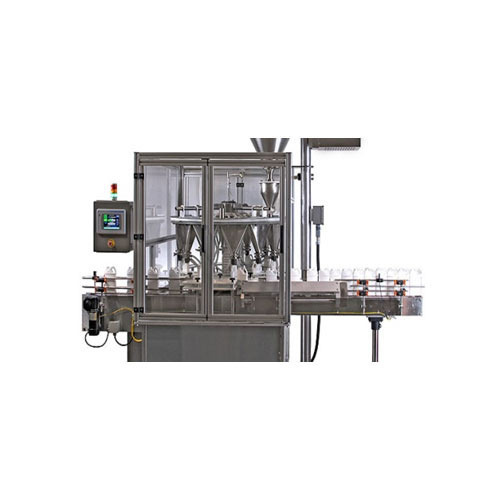 Automatic Single and Multi head various type and shape of bottles, Jar , Tin with maximum speed of 120 Bottles per minute depending on Fill Volume, type of Powder and Bottle Size using Single track and multi track with multi hopper system. Machine with proven Augur type Powder Filling System for filling higher grammage of Powder in Single Dose as well multi doses. All Parts coming in contact with powder are made from SS316, Nylon and HDPE material. Machine with no change parts system for change in Size of Bottles due to pneumatically / indexing as well start wheel operated bottle separator system. Machine with built in Turn Table for Round Bottle at the infeed for continues feeding of bottles. Injection vial powder filling machine, Injectable Dry Powder Filling Machine,Our Powder Filling Machine is manufactured stringently to meet the client’s requirement. 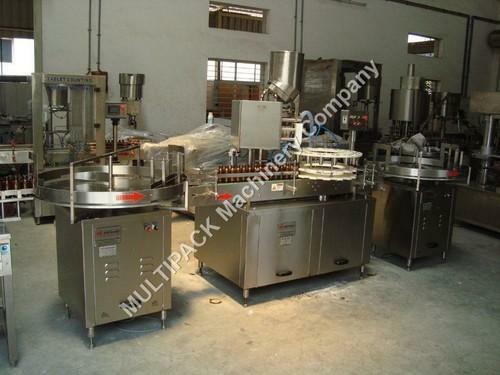 Available in varied models as opted by the clients, this Powder Filling Machine ensure optimum performance. Provide hassle free functioning for dry powder and external dry syrup filling. It is visually compelling and functionally superior in nature. Our Powder Filling Machine is simple & easy to operate or handle & occupies minimal space. 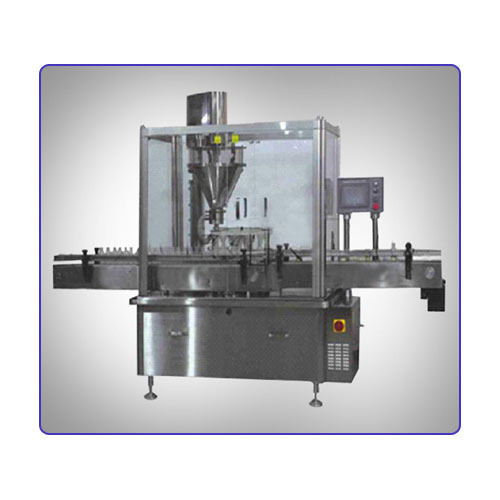 This Powder Filling Machine is renowned to provide optimum production with minimum weight variation. “No Vial – No Filling” system eliminates wastage of costly powder. Overload Relay for any overload accident. Flexible to suit from 5 ml. to 30 ml. vials. All Contact Parts are of S.S 316L. Quick change over with minimum use of tools. Contact parts are removable for mandatory autoclaving. These Automatic Rotary Powder Filling Machine are made from very high quality raw material which ensures hassle free work performance at its user end. These Automatic Rotary Powder Filling Machine are technologically advanced and confirm to industrial quality norms of international standard. 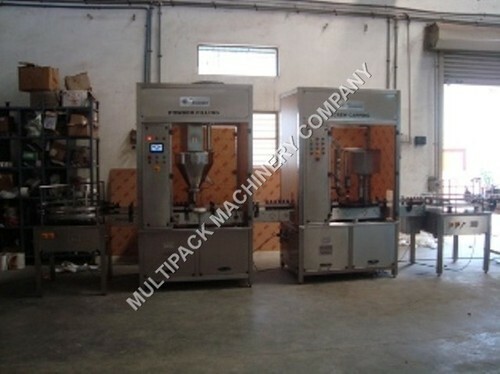 These Automatic Rotary Powder Filling Machine are widely. Max. 100 Bottles per minute depending on Bottle Size, Bottle Neck Diameter, Type of Powder, Fill Volume, Type of Cap and Cap Size. We have carved niche in the industry by offering an excellent range of Rotary Dry Syrup Powder Filling Machine. Our offered machine is well known in the market for featuring variegated attributes like high efficiency, consistent performance and comparatively low maintenance. Besides being manufactured using guaranteed components and advanced tools, this machine is rigorously tested upon various parameters. Clients can avail the entire machine from us at market leading prices. Looking for “Powder Filling Machine for bottle and Jars”?